Have you ever downloaded a PDF and noticed that the links are clickable? “How on earth did they do that? !” you may have said to yourself (if it was out loud, it’s ok. I won’t tell anyone.) Well, it’s super easy, and you don’t even need a fancy PDF program like Adobe Acrobat. 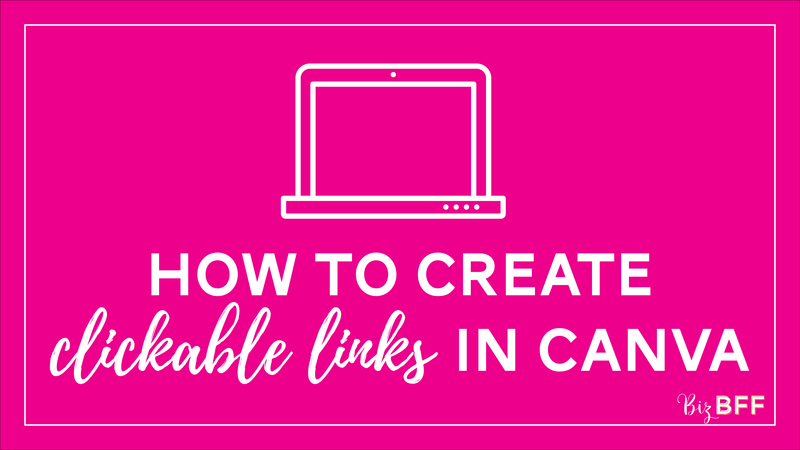 You can add hyperlinks right in Canva! The first thing you need to know is that this only works for PDFs. It doesn’t work for JPGs or PNGs. You can not make a clickable link in an image like that. If you’ve seen a picture on FaceBook and clicked it and it went directly to a website, it was probably an ad that was set up that way, it wasn’t the image itself. Want to learn how to do more awesome things with Canva? Sign up for my FREE Canva Crash Course right here! Want love notes in your inbox? I haven’t tried it, but if you make the URL that you link to start with “mailto:” so that it is like “mailto:info@bizbff.com” then I think it will make the user’s email program open up with that address in the to line. YES! That is annoying! Same with trying to change the font of just one word. I’m hopeful that this is something they improve in the future! It appears that Canva has removed the hyperlink feature for free users. (I don’t have premium, so I can’t say what it’s like on the other side). Hi Grace! I just checked and it is still available on the free version of Canva! I use the free version 🙂 If you are using the phone app, it looks like the hyperlink feature is not available on the app–probably because hyperlinks only work for PDFs and presentations. You can always start a design on the app and then pop on to your computer to add the link and download! So, if you want to do put multiple hyperlinks in a document, you have to create a separate text box for each website you want to link? I made a document in Canva. I downloaded it as a pdf. Yet my links still come up as just a black box. Don’t use the hyperlink option on the left-hand side. Use the link option on the right-hand top corner. YAY! I’m so glad you got it to work! Can you Post on Facebook? If not how can yo do this? Thanks! You can post on facebook, but links are only clickable on a pdf… so it’s not going to show up as an image that you click and it takes you to a page. Usually when you see this on facebook, someone is sharing a link and facebook pulls up an image from that website! I can get this to work when I download it and open it, but when I send it to someone the links don’t work. Any suggestions? Hmmm are you sending the downloaded PDF or are you sending a link to your Canva design? If you send it as a PDF the links should work just like they work when you open it on your computer! (It’s possible that their PDF reader is blocking links as a safety measure though–something they can control in their settings/preferences) If you’re sending them a link to your Canva design, then it probably won’t work the way you want! I am sending it as a PDF. My guess is that the person receiving the pdf has it their safety settings to block links! So that’s something they’d have to adjust in the settings or preferences for their pdf reader!